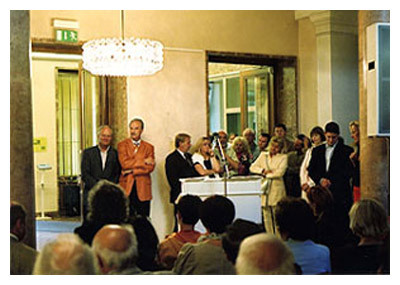 Catrin Bolt was awarded the Promotion Prize for Fine Arts of Kärnten/Austria which obliges her to arrange an exhibition at the Galerie Kärnten. Catrin Bolt will not exhibit paintings but announces a performance at the opening instead. When the speeches begin (the commissioner of culture in Kärnten is Jörg Haider), she leaves the event. The opening itself, the speeches, the audience, the buffet turn out to be the actual performance. Catrin Bolt hires a photographer to take pictures of the night which she wants to exhibit at the show the next day. However, the gallery refuses the hanging.